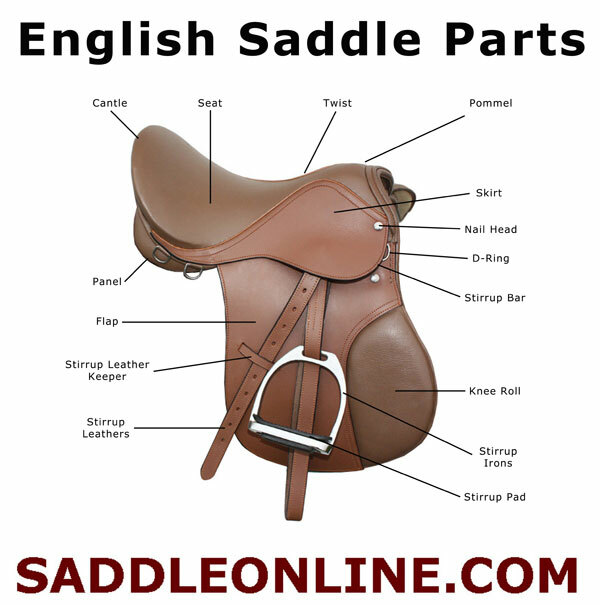 Learning how to correctly name and identify the parts of an English saddle is a basic part of learning to ride. All of the parts of the saddle serve a function that helps make the saddle comfortable and effective. Pommel: The pommel of the saddle is the area at the front of the saddle where the bars and the gullet of the tree come together. 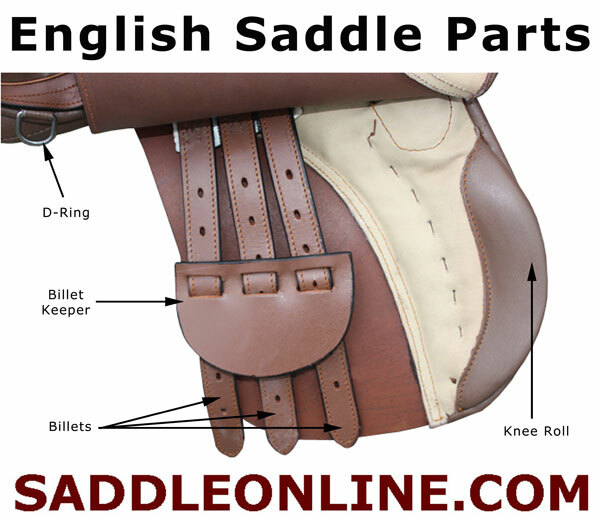 Cantle: The cantle forms the back of your English saddle. It is also the back of the seat. It is turned up slightly on most models in order to help support the rider. Seat: The seat of an English saddles is the part of the saddle that the rider sits on while riding. It is located between the pommel and the cantle. English saddles are measured by the size of the seat. Jockey: The jockey on an English saddle is a small flap of leather that is attached the seat directly over the stirrup bar. It covers the metal stirrup bar and smooths the transition between the seat and the flap. Flap: The flap is positioned under the jockey and stirrup leathers on an English saddle. It conceals the saddle's billets and girth. Gullet: The Gullet of an English saddle is the channel that exists between the bars of the tree. It is positioned directly over the horse's spine. Twist: The twist is positioned between the pommel and the seat and is identified as the narrowest part of an English saddle. Panels: The Panels provide cushioning between the back of the saddle and the horse. They are located underneath the seat on the bottom of the saddle on either side of the gullet. Knee Roll: Not all English saddles have knee rolls. They are an optional feature that is added to the front of the flap and designed to help the rider's leg stay in contact with the flap and prevent the rider's knees from slipping too far forward on the flap. Billets: There are three billets on each side of an English saddle. They are located underneath the flap and used for attaching the girth to the saddle. It is common to use two of the three billets on either side of the saddle and leave one hanging without anything attached to it. Girth: The girth is used to hold the saddle on the horse. It is attached to the saddle using the billets and tightened by the rider during saddling so that it holds the saddle on the horse snugly. Stirrup Bar: The stirrup bar is a small piece of metal that is used to attach the stirrup leather to the saddle. It is positioned directly under the jockey. Stirrup Leather: The stirrup leather is a leather or synthetic strap that is used to connect the saddle to the actual stirrup. The leather is attached to the stirrup bar. Stirrup: The stirrup is a triangular metal frame that the rider's foot sits in while riding. The stirrup is also used to help rider's mount and to provide additional support and stability to the rider's leg and leg position while riding.